ARLINGTON, VA; February 14, 2012 – PBS announced today the details of a weeklong exploration into the issues related to the shootings in Newtown, Conn., that airs February 18-22. The specials harness the wealth of PBS producers’ content expertise to shed light on December’s tragic events. Programming during the week will include nightly news reports from PBS NEWSHOUR, a special collaboration between FRONTLINE and The Hartford Courant, a science-based investigation on NOVA, analysis of the issues on WASHINGTON WEEK, a human interest report on NEED TO KNOW and two independent documentaries. AFTER NEWTOWN: GUNS IN AMERICA is an unprecedented exploration of America’s enduring relationship with firearms. From the first European settlements in the New World to frontier justice; from 19th-century immigrant riots to gangland violence in the Roaring Twenties; from the Civil War to civil rights, guns have been at the center of our national narrative. Americans have relied on guns to sustain communities, challenge authority, and keep the peace. Efforts to curtail their distribution and ownership have triggered epic political battles. This program traces the evolution of guns in America, their frequent links to violence and the clash of cultures that reflect competing visions of our national identity. In the wake of the mass killings at Sandy Hook Elementary School, FRONTLINE investigates a young man and the town he changed forever. Adam Lanza’s motives, and his life, remain largely a mystery. With The Hartford Courant, FRONTLINE looks for answers to the central — and so far elusive — question: Who was Adam Lanza? Also this hour: In the aftermath of the tragedy, President Obama called for a national conversation about guns. Nowhere is that conversation more intense than in Newtown, where FRONTLINE finds a town divided and explores how those closest to the tragedy are wrestling with our nation’s gun culture and laws. What makes a person walk into a theater, or church, or classroom and open fire? What combination of circumstances compels a human being to commit the most inhuman of crimes? As the nation tries to comprehend the tragic events in Newtown, NOVA correspondent Miles O’Brien investigates theories into what drives rampage killers. Could suicide — and the desire to go out in a media-fueled blaze of glory — be their main motivation? How much can science tell us about a brain at risk for violence? Most important, can we recognize dangerous minds in time to stop the next Newtown? Psychologists, working with law enforcement officers, have devised tools to prevent violent attacks. THE PATH TO VIOLENCE details a powerfully effective Secret Service program — the Safe School Initiative — that has helped schools detect problem behavior. However, shooters like Adam Lanza, Jared Loughner and allegedly James Holmes all executed their attacks after they’d left school. Can the gains made by psychologists and law enforcement be extended to encompass parents — terrified of their own children and inadequately helped by mental health and legal systems — and families of violent individuals? Is the country ready for a national conversation about the balance between school safety and civil liberties that interventions, including gun control, require? Managing Editor Gwen Ifill moderates a segment discussing how Washington lawmakers are addressing the issue of gun control. The damage done by the massacre of more than two dozen children and adults in Newtown, Conn. last December no doubt will reverberate for years. But much smaller shooting incidents that get little media attention also have profound consequences. One such incident occurred exactly 20 years before Newtown. At a small college in western Massachusetts, a disturbed student went on a shooting rampage and killed two people. Even today, the families of those victims and survivors of that incident are still trying to come to terms with what happened that day. Maria Hinojosa reports. 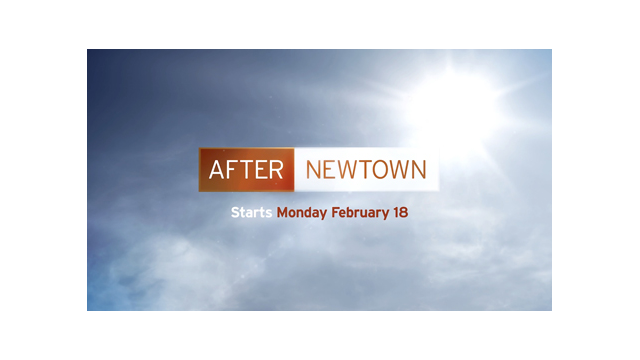 Each newscast will include a segment exploring issues surrounding the Newtown tragedy. Monday, February 18: A report on how the community of Aurora, Colorado (the site of the Columbine High School shootings) is reacting to the national debate stirred by Newtown and the recommendations for reducing violence proposed by Vice President Joe Biden’s task force. Tuesday, February 19: Senior Correspondent Jeffrey Brown reports on the ongoing debate about the connections—or lack of connections—between violent video games and violent behavior. Wednesday, February 20: Science Correspondent Miles O’Brien explores what scientists know and don’t know about adolescent brain development, and what risk factors may lead a young person to violent behavior. Thursday, February 21: A report from Florida, the first state to record more than one million requests for permits to carry concealed weapons, explores the increase in requests for gun licenses in the wake of Newtown, and the arguments for and against concealed-carry laws in the state where Trayvon Martin’s killing is still a fresh memory. Friday, February 22: From Chicago, a look at gun violence as a public health issue. Secretary of Education Arne Duncan recently shared that many more children die of gunshot wounds every day in Chicago than are killed by mass murderers in a year. In addition to this special week of programming, PBS NEWSHOUR will provide ongoing analysis, insights and panel discussions on the policy and political debates coming out of the Newtown tragedy, the Biden task force proposals, and the President’s State of the Union address on February 12.